A custom homepage featured slider to showcase your portfolio content, all powered by the fully responsive FlexSlider, which makes it usable on mobile devices. You can easily use this for photography too. An easy way to welcome your visitor to your blog, or tell them something about your site. Title and text typography can be customized via options panel. You can customize the typography in the theme to suit, and there is full support for Google Fonts in the font selector. By default it is using Lobster, Droid Sans and Droid Serif. 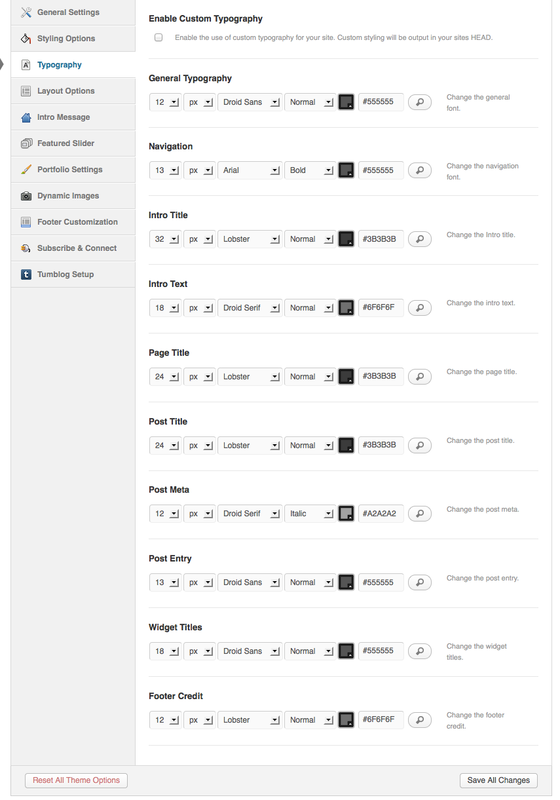 The theme has 1 widgetized sidebar and up to 4 footer widgetized areas, and as always comes with custom Woo Widgets (Ad Space, Blog Author, Video/Embed, WooTabs, Subscribe & Connect, Search, Flickr and Twitter). Beveled has been made compatible with the WooTumblog plugin, so if you enable it, you’ll get all of the features listed below! It also works fine without the plugin. This theme support the Express App for iPhone, which lets you post images, notes, links and quotes while on the go! Posting a variety of multimedia elements (images, video, audio, quotes, notes & links) is super-easy to do and the theme handles all of the different “post types” auto-magically.